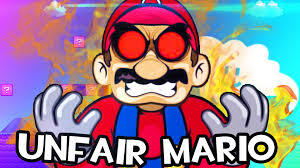 If you are tired of the usual “Super Mario Bros ” version and wish to take the challenge to a new level, come to the “Unfair Mario” game, you will experience the game. With unusual difficulty with invisible enemies and difficult obstacles. You will definitely want to go crazy and break the screen with this inimitable game to watch. How to play Unfair Mario?